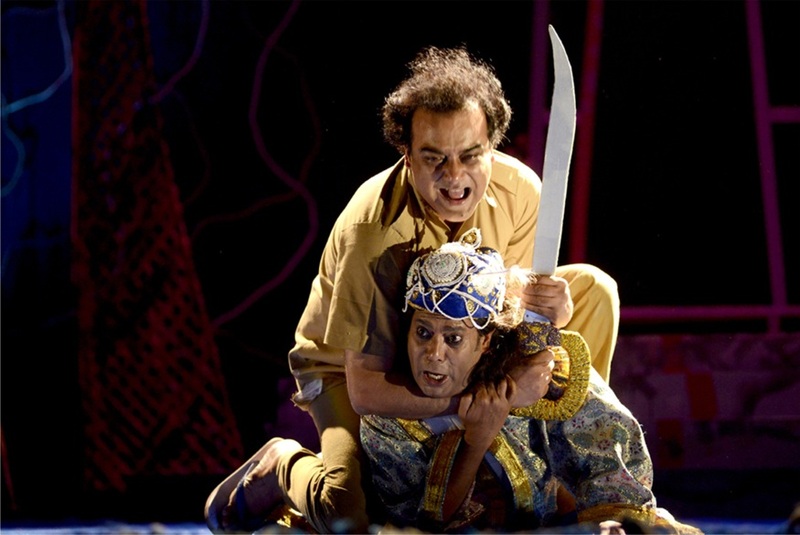 The play is centered on the protagonist “Prasanna” who was a renowned Jatra artist, but had fallen prey to the natural order of decaying time, political conflicts of his fellow artists, and had been antiquated as an artist. He lives in the nostalgia of his past life, when he anjoyed his expression of creativity and received love and fascination of his numerous fans and most importantly he earned money and respect. Prasanna was been cheated by his fellow artists which is revealed at the end of the play and they had convinced Prasanna’s family that he had been insane. Prasanna’s son “Kalo” had sent him to the mental hospital against his will. Now, he has been weak and vulnerable emotionally and always lives in a fear psychosis that he will be left out in negligence by his son, “Kalo”. “kalo” , Prasanna’s son, suffers from a duality as he is fond of his father’s artistic expression, but cannot accept his schizophrenic traits and his disability to earn money for which he had to work as a labor in a manufacturing industry. His conscience of being a son of an artist also barred him to be in cultural connection with his fellow collegues. He vomits these frustrations through violence upon his father. These crises of existence and identity of father and son is complimented with love and affection of “sati”, Prasnna’s Wife and “Asha”, Kalo’s fiancé. Prasanna’s gets a call suddenly arranged by his friend and fellow artist “Harisadhan” who used to act the roles of women and leaves house for a series of shows and again starts earning money. When he comes back, he heard the news of death of “Harisadhan”. This leaves him emotionally devastated as they had almost spent more than decades while they were artists respected and desired by public. The same day, he again gets a call from more commercial manager of a “Jatra “ group rather the team leader of artists, and decides to leave home again ignoring his wives’ pleadings. He realizes that though he is old and weak, yet the only means of his survival is when he expresses through his performance. His whole existence is dependent on his ability to express artistically in front of public. Even if he is not been able to be a star again, may not be he again be the hero or the show stopper, yet he must be on stage live a life of an artist, and prove to himself that he is alive as he is performing. A performer performs till death. The philosophies of positive life, truth drives him again to forget all his pains, struggles for respect, disrespect and he again decides to act and be an artist. “Saudagarer Nouka” by Ajitesh Bandyopadhyay is a blistering polemic regarding the crisis of identity and relevance of an artist while the form of performing art is under a threat. The play is based on a time period, when the rich cultural art form of Bengal, “Jatra” is negotiating with its relevance as a form of entertainment with more spectacular and technically ornamented art forms like Theatre and Cinema. Every art form and artists involved with that art form experiences this juncture of time, when the desires and the quantum of pleasure derived from the mediums of entertainment undergoes a transformation, and a certain form of art form becomes irreverent as narrative story telling becomes more engaging with technological innovations. The narrative of the play revolves around a onetime renowned “jatra” artist, whose artistic expression could not attract audience’s sensory observation due to his old age and most importantly because the form of performing art that he was comfortable to express his experiences, was becoming obsolete and was almost moving towards the verge of oblivion. The emotional crisis of an individual of not being able to express, followed by poverty and disrespect from his own family members still now captivates the empathy of audiences for the protagonist. The reason for this emotional connect which still happens with the audiences and the play is that now, in this age of technology ruled world, art has been dependant more on technology rather the drive to find out ways to express one’s own experiences of life. Any artist now has to be acutely aware of the continual struggle between innovation and expression. While technology innovation is ever growing and at an alarming fast pace, artists and craftsmen, are victimized as any day they might not be able to master over a new technical alien, and they will be outmoded. Theater currently is facing the same struggle of existence as an art form within the spectrum of new media forms and digital aggression also intra struggles where technology is changing the language of theatrical expression all together. Thus “Saudagarer Nouka” holds its relevance in this ephemeral time of both any form of art and an artist, when genres, language of expression, artists, and art forms are transient.